PlayerUnknown’s Battlegrounds is a huge success, welcoming over eight million players into its deadly battle royale arms. That’s eight million people, all experiencing the exact same map. Erangel is the only available map currently available in the game, and sure it’s massive, but a change of scenery would be nice after spending hundreds and hundreds of hours playing. Other players seem to feel the same way, pushing for more information about any upcoming map additions. 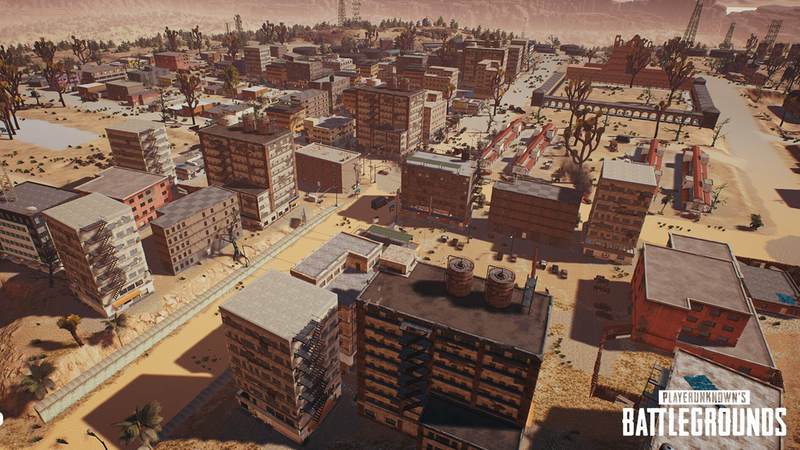 Happily, during their gamescom 2017 keynote, developer Bluehole released a new work-in-progress image of their upcoming desert map. It was then tweeted out and is viewable below. This is a shot of the city area, and wow it looks absolutely crammed full of buildings. I can see a lot of hiding spots and opportunities for sneaky plays, but also room for intense gunfights as players move from cover to cover. Of course, the map is still being worked on, as is PUBG‘s level of optimization. Here’s hoping it plays great! What do you think of how the new desert map is looking? Happy about this environment, or want to see something different? I’m hoping a snow map is next! The original Erangel map is also being targeted for some drastic changes, with the developer wanting to “sort of remake” it!